The Frighteners is a tale of revenge with a supernatural spin. The main characters in the book are Eddie Brinkburn and Rennie Montresor. Lifelong friends, they co-own a garage. They make a living but are far from rich and Eddie’s wife, Tracey, is far from well. In fact, she is in desperate need of an operation and Eddie fears that she might not survive the NHS waiting list long enough to make it to the operating table. It is partly because of Tracey’s ill health that Eddie takes on a little extra work, from time to time, for the local gangster, Sheraton. Usually, it is just a case of fixing up a few hot motors, but when the owner of another garage refuses to pay Sheraton’s protection money the heavies are sent round and Eddie and Rennie are asked to be the getaway drivers. It all goes wrong and Eddie and Rennie end up being behind bars instead of under cars. So does one of the heavies. The other one is not so lucky. He ends up in the hospital with severe burns. The man with the melted body is Sheraton’s little brother. Sheraton is not happy about the situation so he arranges for Eddie’s wife and kids go up in smoke. Then when Sheraton’s brother dies a little accident is arranged for Eddie and Rennie as well, but the prison psycho, Archie Duncan, steps in and saves their lives. Duncan is a man of few words. He uses the same few words, all of the time: “How much do you hate?” This time Eddie has an answer for the madman. He hates a lot. He is consumed by hate and has never hated so much in his life. That’s all that Duncan needs to hear and the terrible power trapped inside the madman’s body is transferred into Eddie instead. Eddie quickly learns how to use his new power to put the frighteners on his enemies. The warden is the first person he puts the frighteners on and he keeps putting them on, every night, until he is given early parole. Then he starts to bring Sheraton’s empire to its knees. The Frighteners was first published in 1990. It’s set in the UK and during the 90s patients really did have to wait a long time for operations—and it isn’t much better now—so Eddie’s initial predicament is all too believable. 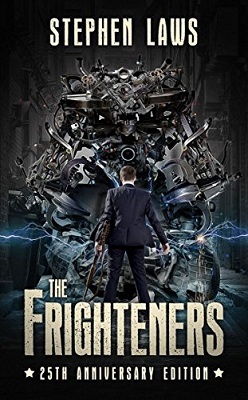 I enjoyed reading The Frighteners, but it didn’t grip me as much as some of Laws’ other work. I’m not sure why. Perhaps I didn’t care enough about the characters, or maybe there weren’t enough other things happening in the story, apart from Eddie’s quest for revenge and the strange way he went about getting it. Whatever the reason this isn’t one that I would want to read again and again.